The following is an outline of our physiotherapy programme’s recent initiation of a curriculum review. While there have been some minor amendments of papers, it had been 8 years since the role out of our current undergraduate programme. A change in the Programme Management in August 2018, has enabled a focused review of the curriculum as a whole- supported by incidental reviews leading up to this time. “Do a few things well”– then move on. I was keen to establish the idea that we would tackle a couple of areas of the curriculum at a time- though always returning to the agreed framework that had been established to ensure that if fitted with the overall vision for the programme. Empathising– understanding the human needs involved. This includes consulting (and re-consulting) the students, staff, and stakeholders to understand more about their concerns about the programme. Engaging and empathising to understand their experiences and motivations of the current curriculum, which allows setting aside of own assumptions of the needs of the programme. Prototyping– adopting a hands-on approach in prototyping. The group then presents a number of versions to the staff- or sub-group. The aim is to identify the best solution for each problem statement. The solutions are investigated and either accepted, improved and re-examined or rejected based on the responses. Testing– developing a prototype/ solution to the problem. While the final stage includes the application solution, there may be further refinement as a deeper understanding of the impact of the implemented solution is developed. Empathising– Once the group had been established, I arranged a meeting (utilising www.doodle.com) and set about gathering some background information so we could start the process well informed. This included a review of the framework models and common themes proposed by teams of staff before amalgamating the models into the “preferred” framework. I also met with the Student Representative Group to ensure that I had “student voice” in any proposed changes. At the meeting (23rd July), there was general consensus in that we agreed (1) we had some good content already; (2) we want the programme to regain the “gold standard” status we had as a physiotherapy programme; and that (3) it was the framework [and delivery] that we needed to turn our attention to, and- with continued feedback from staff and students- ideas would be informed, presented, redesigned, implemented and evaluated. Defining– Key members of the Curriculum Working Group were delegated to gather further information on identified “key themes”. Information was gathered then presented back at the next staff meeting (21st August). From this, we agreed to focus initially on two key themes for the overall framework- (1) the integration of research, and (2) the role of optional papers within the programme. 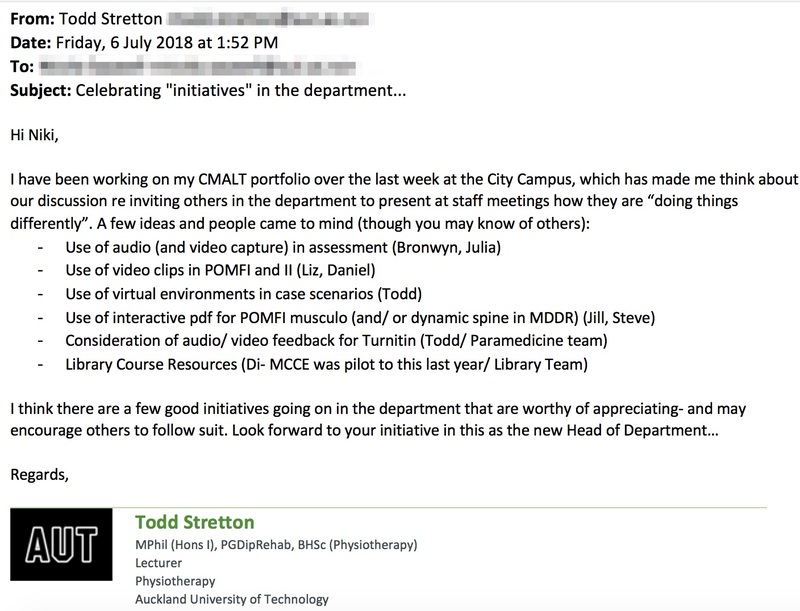 Ideating– Based on information gathered at the empathising stage, and then confirmation of key themes at the staff meeting, I was able to immediately put research and elective options to staff in a survey sent via email (21st August). The aim was to provide staff with six options, to then determine a preference with qualitative data on their reasoning. The survey was open for just under a week (21st- 27th August) which resulted in a response rate of (78%), with 21 responses from the 27 current teaching staff. The results enabled us to identify two main options, which I then presented in a narrated PowerPoint via an unlisted YouTube Link (13th September). The aim was to provide staff a final opportunity to discuss and consider prior to the next staff meeting (24th September)- after which the Curriculum Working Group would proceed with the identified preferred option for research and electives. This will not be able to be tested until 2020, which would be the first year any curriculum changes would be implemented from this date. With the regular Curriculum Working Group meetings and a sense of progression and being updated, it had been rewarding to see the collective ownership and shared responsibility that is being developed within the group. This includes two staff who have presented the pros and cons of the two options at the next staff meeting. My use of technology as the working group has met and then updated staff has not been incidental. By utilising the various modes of delivery (PowerPoint, SurveyMonkey, staff meetings and YouTube Video) I have inadvertently showcased alternative ways of engagement that has been commended by others, been suggested as good approaches in collating information and have has been requested as a great way to readily receive information in the future. While this appears to be an involved process for two aspects of a curriculum framework (Research and Optional Papers)- so it should be. I will be utilising elements of the design thinking process and Educational Design Research as I lead the Working Group in the curriculum review. Already, it can been seen that by utilising these processes, that the appropriate users are engaged with, empathised with; that ideas are defined, options are developed, prototyped (and later- tested), and then evaluated. It is envisioned that this Blog Post will be updated at the next CMALT review. McKenney, S. & Reeves, T. C. (2018). Conducting Educational Design Research. (2nd Ed). Routledge: London. To ensure fair and equitable assessment processes that are consistent with others within the Faculty (and University), each paper/ module reports on assessment moderation. While this can be fairly easy to plan, execute and evaluate for paper-based assessments (i.e. written examination, assignments and reports), the consistency of assessing practical skills can be problematic. Currently, the physiotherapy programme includes (1) pre-assessment moderation meetings; (2) cross-marking within the scheduled examination period; and (3) post-assessment moderation meetings. I was approached by the physiotherapy management team to investigate the use of audio and video moderation of examinations. This subsequently led to the development of a guideline/ policy for the Physiotherapy Department. How will the students be informed of the video and audio being captured? How will the video and audio be captured, and will it be able to capture the movement throughout the practical examination? Will there be enough storage space on the device to capture ALL examinations? There was some contention as I suggested that the newly purchased video cameras (Sony HDR-PJ410) would not be sufficient and further cameras would need to be purchased. While my argument was based on a comparison of the current cameras to specifications required at a similar cost- the School budget did not allow the purchase of further cameras. I also consulted other key staff members who were involved in the practical examinations as well as colleagues in paramedicine and nursing who were already recording their assessments. When considering all the above, it was clear that while there was value in establishing recording for the purpose of moderation; there were no clear guidelines or policy to work from. This was confirmed at a meeting with the Faculty Associate Dean (SS). Overall, my reflection on the current issue (consistency of moderation of practical examination) and consultation with others led to the development of a Guideline for Audio and Video Recording for Assessment Moderation. As the paper booklets for Semester Two 2018 had already been published, these Guidelines were not able to be implemented in full this semester. It was pleasing that those papers intending to use the recording for moderation had already included some information in their published booklets. They then utilised the remaining guideline information to better inform the students online and on the examination timetable. One paper I am involved in did include the recording of assessment. We met as a team to discuss how would use the audio recorders (including what would state; to “stop” at each exam to create separate files, and that would review any that were unsure of final mark and those that were receiving a fail mark). In future updates of this guideline, I would include the suggestion on a pre-moderation meeting to discuss the consistency of recording (as outlined above). It has also since been confirmed (November 2018) that as the recording is part of a moderation of assessment, that the student’s right to refuse recording; and ability to withdraw consent for recording can be removed; though students can still request to listen to the recording if they wish. Limited tools = no fiddling…#1. As the tools available in the Evernote presenter is fairly limited, this, in turn, limited your ability to spend potential hours on perfecting the slides; or adding in unnecessary slide transitions or animations… It is simply (1) decide on the colour of the pointer; (2) colour of the background- white or black; and (3) the font size. External links and back- no problem. When an URL link is clicked in Powerpoint, the presentation is superimposed by the browser which then requires the user to escape, find the PowerPoint again to then return to the rest of the presentation. In Evernote however, while a full screen of the external link is provided, you have the option to open the image in the browser or to return to the Evernote presentation at the click of a button (top left corner when presenting). Makes for much simpler transfer between open applications. Present on another screen?- easy. Evernote gives you the choice of which available screen you want to present on (right click on the Evernote and choose “Present on another Screen). While this is available in PowerPoint, it is a bit cumbersome (Slide Show-Set Up Show- Monitors). Images/ pdf difficult to view online. When the audience clicked on the link for the associated Evernote, the web-based outline unfortunately warped some of the images. However, this could be rectified by clicking on the attachment icon, by “viewing as presentation” or “View in Evernote”. Limited tools = no fiddling…#2. With the limited tools, it does mean that you would need to ensure that any images you need are already developed beforehand- either using Evernote tables, audio or video recorder or file from external software. This might lead you back to PowerPoint which was the case for me as I included slides from a previous presentation. Images to pdf. On the note of inserting slides from other software, Evernote converts these images as pdf. I am unsure of the rationale for this, other than might mean that viewers are unable to change the image and/ or to reduce the size of the files. The consideration of other media to relay content knowledge aligns with Gavriel Salomon’s (2016) learning theory of Symbols System which acknowledges that we utilise different types of media to correlate with the different levels of processing required to enable acquisition of knowledge. The use of Evernote was geared specifically for a a small audience- and while my first experience of using the presentation tool was positive, it is not something that I would utilise for a two-hour lecture to students… …yet. I have since utilised Evernote to present in other small group meetings (e.g. the Curriculum Working Group) which has been met with, “Oh, that’s different… …what are you using?”- followed by an ad hoc teaching session with those interested in the use of Evernote. Salomon, G. (2016). Interaction of media, cognition, and learning an exploration of how symbolic forms cultivate mental skills and affect knowledge acquisition. New York: Routledge. ISBN: 1138972959 9781138972957. In 2016, I entered as a joint Paper Coordinator for a third-year physiotherapy undergraduate module (Managing Complexity in the Community Environment). We inherited a paper that was very didactic in delivery and required the students to incorporate their collective knowledge on the module into one Summative Assessment as a written assignment. While the assignment had to be submitted to Turnitin for a review of plagiarism; students were also required to submit the same assignment to Blackboard for the purposes of marking. This seemed non-intuitive and open for error. Student reviews for the paper in 2015 were “average” to say the least, and as incumbent Coordinators, we agreed that we would utilise creative liberty to refresh the delivery and mode of assessment. We gathered up the teaching team to discuss a new approach to the assessment. The teaching had been delivered by four lecturers- all with their own specialty. The purpose of the paper was to demonstrate complexity in common physiotherapy conditions. With the teaching being delivered by four key lecturers- all with their own specialty- it was proposed that we adopt a problem-based learning approach, which used complex case scenarios from the four key areas as a mode to assist complex clinical reasoning and consideration of interprofessionals. These cases were delivered in small group teaching to enable discussion and exploration of the scenarios- some of which included blended learning through a virtual environment (myself) to incorporate resources they would readily utilise when on clinical and graduation, as well as to promote “investigation” of the scene- rather than providing all clinical features for the students.. .
We also wanted to emphasise the importance of good clinical documentation- in particular- referral letters to interprofessionals. Our first summative assessment, therefore, included submission of a 1 1/2 page referral letter (with 1/2 page of endnotes) that was submitted to Turnitin (Appendix 1). By keeping the assessment relevant to the case scenarios presented in the small groups; the assessment clinically relevant; and also some creative license (i.e. students came up with their own letterheads; business name; digital signature: and logo)- it made it all manageable for students. By submitting once to Turnitin and utilising the available marking tools (including cut and paste; user strings, etc) it made for easy turn over of feedback to students which was then utilised for the second summative assessment (clinical reasoning regarding the content of the letter). This approach has been found to be successful by the teaching team, with the students quickly seeing the clinical relevance- rather than “just another assignment”.